Maybe there is hope for the future. I present as Exhibit 1, xkcd, the brainchild of Randall Munroe. In case you haven’t heard, xkcd is not some magically goo that you dab on your CDs to make them sound more like vinyl, but one of the hottest webcomics. Webcomics are not just the future of comic strips, they are the only future of comics. Print newspapers, the birthplace of comics over a century ago are so, so dead. Moreover, print despite the best efforts of the masters of comic art, could never completely escape the box of space allocated to them by the newspapers and their affiliated syndicates. Webcomics, on the other hand, are virtually limitless. Anything that can go on the web can go into a comic. If xkcd were a song, it would be “Bedbugs and Ballyhoo” by Echo and the Bunnymen. This month’s commentary will dispense with the much of the usual bloviating and let Munroe’s work sing for itself. The alternate text, which you can read quickly by mousing over the strip, as with many other webcomics, is a critical element of xkcd. It provides the opportunity for Randall to test the obscurity quotient of his reader. Then, xkcd eats Peanuts for lunch, sleds past Calvin & Hobbes, and almost manages to approach the greatest comic of all time, Krazy Kat. George Herriman’s sublime strip developed its lasting greatest in large part because it was protected from the corrupting influence of the masses by William Randolph Hearst, the real-life Citizen Kane who was devoted to the strip and paid Herriman’s bills. 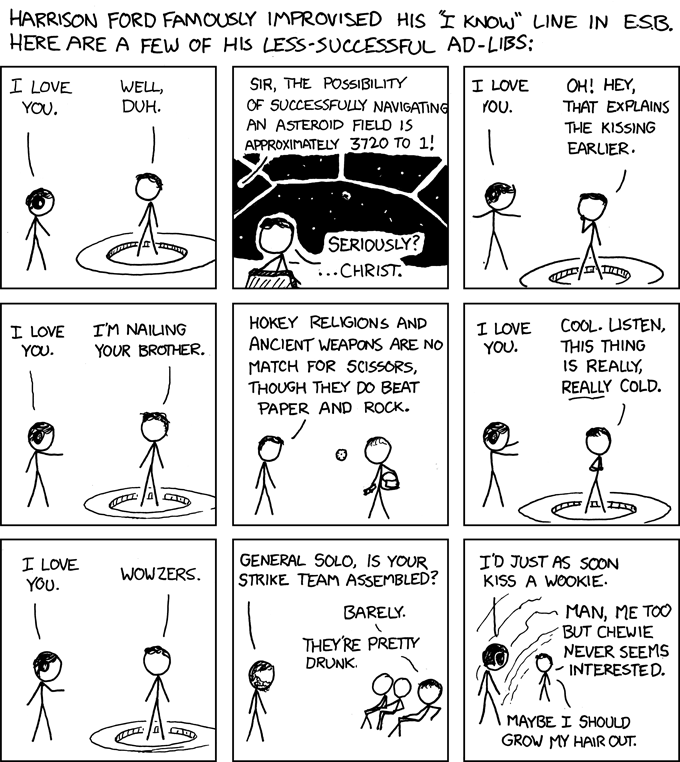 The Internet (and T-shirt sales) may give xkcd the breathing room to mature to reach its fullest potential. We’ll just have to see. Copyright 2009 by Miller Risk Advisors. Permission granted to forward by electronic means and to excerpt or broadcast 250 words or less provided a citation is made to www.millerrisk.com.